Join us on our exciting river and land journey to Portugal, renowned for its rich culture, fascinating history, and stunning beauty. Explore important sites during two days around Lisbon followed by a seven-night cruise on the scenic Douro River. While our group was on a small ship with other groups, we felt very fortunate to have our own subject matter expert and logistics facilitator to make our trip special and rich. Save $500 off per person on our July 15-26, 2019 cruise when you book by May 10, 2019! Portugal is renowned for the Age of Discovery, Old World towns and centers of learning, rabelo (sailboats) loaded with casks of port plying the Douro, and distinctive blue azuelos (tiles). Encounter all this and much more during our land and river cruise program featuring seven nights aboard an intimate riverboat. Lisbon to Coimbra: Explore the treasures of Lisbon, including the Jeronimos Monastery, Tower of Belém, and Monument to the Discoveries, and enjoy a performance of traditional fado music. Then travel to the ancient town of Sintra and fishing villages of Cascais and Estoril. In Coimbra, gaze upon the spectacular university library and tour the fortress-like cathedral. Cruising the Douro: In Porto, discover sites on a city walking tour or take a tram tour, and savor a taste of the area’s port wine. Visit the town of Guimaraes, Portugal’s birthplace, or take a hike along the river. Cruise along the meandering Douro River to Pinhao, stopping off at traditional towns and vineyards along the famous wine trail. And on a day excursion, explore the glories of Spain’s Salamanca on foot or by bicycle. Amalia Rodrigues / Gil Eanes: These newly built ships feature three decks and include spacious lounges with large picture windows, full-service restaurants with just one seating, a library, and spacious sun decks with chaise lounges to enjoy the spectacular scenery of the romantic Douro valley. 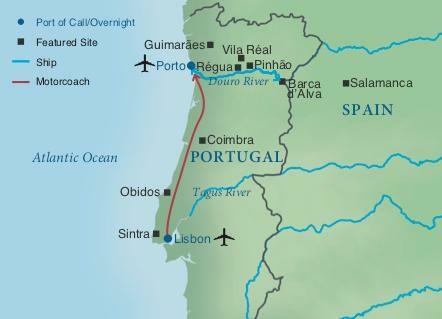 * July 15-26 departure will cruise on Amalia Rodrigues, while the October 1-12 departure will cruise on Gil Eanes. See more information about these ships on the Tour Details page. Each voyage will also host other leading cultural and educational institutions, which will add to the excitement and energy of the experience. Smithsonian Journeys Travelers depart the U.S. for Lisbon via overnight flights. Start each day with a buffet breakfast at the hotel. Attend a morning talk by a local expert on early Portuguese explorers. Later, visit Jeronimos Monastery, burial place of Vasco da Gama, and the Tower of Belém, both designated as World Heritage sites. Following Portugal’s seafaring tradition, see the Monument to the Discoveries, built for the Portuguese World Exhibition of 1940. It’s designed in the form of a ship with a statue of Prince Henry the Navigator standing on the bow looking out to the horizon. After breakfast, depart for the historic town of Sintra where you’ll visit the Main Square and the National Palace of Sintra. Enjoy a luncheon of local specialties in Sintra, then continue along the coastal road to the quaint fishing village of Cascais. This morning, depart Lisbon and drive to the charming medieval walled town of Obidos, renowned for narrow winding streets, whitewashed houses covered with bougainvillea and its well-preserved 17th-century architecture. After a guided walking tour, explore the town on your own before continuing the drive north to Coimbra. Coimbra is a World Heritage site known for its University, one of the oldest in Europe. Enjoy lunch in Coimbra then continue to see the famous library, Saint Michael’s Chapel, and the Royal Palace including the Ceremonial Hall. After touring the University, you may want to explore the Old Cathedral commissioned by King Afonso Henriques on your own. Start the day with a hearty breakfast. Today you can choose between two included shore excursions. Choice #1 – Porto City Tour: Begin exploring Porto with a visit to the Stock Exchange, built in 1842. Continue to the Igreja de Sao Francisco, a church originally built in the Gothic tradition and through successive renovations has become a Baroque masterwork. Porto is famous the world over for its fine port wine. Visit a local wine cellar, where you’ll have the chance to sample! Choice #2 – Porto Tram Trek: Travel to the town center where you’ll board a city tram and begin a unique experience in urban sightseeing to see Porto’s points of interest. The excursion will include a stop at the Tram Museum, housed in a former power plant. The museum collection includes the oldest horse-drawn cars and the last trams in operation dating from the 1950s and 1960s. The excursion ends with a tasting of Porto’s local specialties before returning to the ship. Enjoy local cultural and historic highlights with a choice of one of the following included shore excursions. 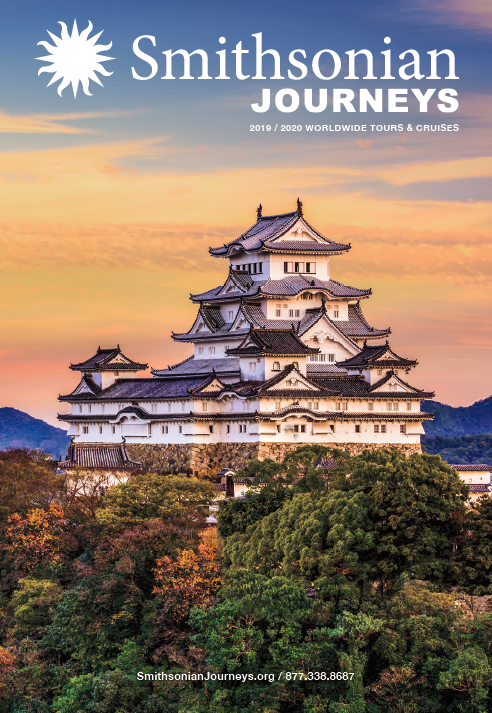 Choice #1 – Guimarães: This historic city, a World Heritage site, is considered Portugal’s birthplace. See its medieval castle and magnificently well-preserved historic town center. With an expert local guide, tour this university town on foot and explore its historic treasures. Discover the Nossa Senhora de Oliveira Church, the most important religious landmark in the city. A maze of lanes and picturesque plazas are evocative of how life was lived in the past. Choice #2 – Hiking Along the Douro: Set out with a local guide for a hike along the Atlantic coastline and the Douro River. On the walk, pass through the fishing village of Sao Pedro da Afurada. Enjoy beautiful views of Porto and the renowned Ribeira Square. Visit the town of Vila Nova de Gaia, where the local wine is aged in its world-famous cellars. Sample the wine in one of a local quintas. Take an excursion to Vila Réal, a small town set amidst the vineyards and famous for its variations of religious architecture. After a panoramic tour of the town, stop and sample a local pastry. Continue on to the Manor Solar de Mateus, built in the 18th century, and considered one of the most beautiful manor houses in northern Portugal. Stroll through the perfectly manicured formal gardens, and see a 115-foot tunnel of old cedar trees. Today take your choice of one of the following included shore tours. Choice #1 – Salamanca City Tour: This morning, depart the ship to visit the historic Old Town of Salamanca, a designated World Heritage site. Visit the Cathedral that has, over time, evolved in style from late Gothic to Baroque. Visit the University, one of the world’s oldest which first opened in 1218. Enjoy lunch in Salamanca, before returning to the ship. Choice #2 – Salamanca Bike Hike: Take a bike ride accompanied by a local guide along the Tormes River before seeing the historic and cultural highlights of Salamanca’s Old Town and some points of interest off-the-beaten-path. Set out to explore the wine trail of Porto to see San Salvador do Mundo and Sao Joao da Pesqueira. These small towns are situated amidst the lush vineyards of the Rio Tinto Valley. In Sao Joao da Pesqueira see the arcade of the Main Square, the town Chapel, and quaint white-washed houses. Visit a quinta to sample the famous port. This morning, travel to Lamego, a charming town, where you’ll visit the 18th-century Nossa Senhora dos Remedios Sanctuary, known for the 686 stairs that lead up to the shrine. It is one of the most important pilgrimage churches in Portugal. Day 12 — Depart for the U.S.